You live and you learn. That’s probably the best saying to sum up college life, isn’t it? You do a bunch of stuff, take a lot of classes and learn both from the books and the life experiences (hey, even the worst ones always teach us something!). 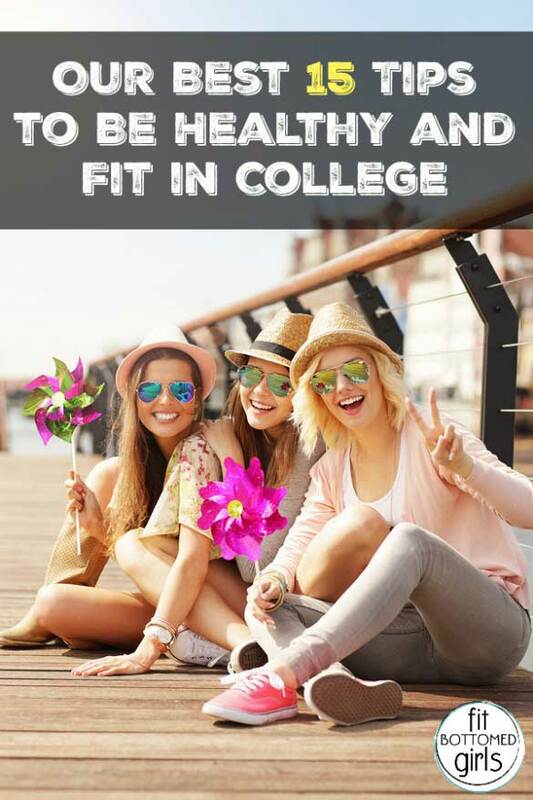 Since it’s Fit Bottomed College Week here on FBG, today we thought it would be fun to share a little advice to those in college now. So read on for the advice and tips we wish we had gotten (and followed, obviously) back in the day! 1. Ditch the daily weigh-in. We beg you to please break up with your scale and stop determining your worth by your pant size. You are sooo much more than that! 2. Eat healthy most of the time. Follow the 80/20 Rule where you eat healthy 80 percent of the time and splurge the other 20 percent. And, yes, that includes booze. 3. Order pizza at midnight when you’re starving and studying for that mid-term with your girlfriends. Those will be some of your best memories (and definitely worth spending your 20 percent on!). 4. Laugh A LOT. Be silly and never take yourself too seriously. 5. Be easy on yourself. Love yourself unconditionally. 6. Know that you don’t have to drink to have a good time. Also, you know that song “We Don’t Have to Take Our Clothes Off?” Well, that one is true, too, and definitely in the same vain/vein. 7. Find out what activities you love. Try as much stuff as you can. You just might find a sport or hobby that’ll keep you healthy for a lifetime! 8. Teach yourself to cook. This is probably the first time you’re really in charge of feeding yourself. Do it the right way by trying new healthy recipes often! 10. Go to class. I know we sound like your mom. But she’s right. Going to class is good for you—and someday in the future you’ll probably miss it. 11. Have random dance parties. Turn on your favorite guilty pleasure tunes and dance your heart out. 12. Enjoy the walk to class. One day after college you’ll walk outside, feel the crisp fall air and wish you were walking to class and not commuting to work. Promise. 13. Use the 24/7 waffle maker or soft-serve ice-cream machine sparingly. It’s fun every once in a while, but doesn’t make for a great regular dinner. 14. Get out of your dorm room. Dorm-room workouts are awesome but getting out with friends on campus—hiking, biking, rock climbing, playing sports, etc.—are good for the body and the soul! 15. Soak it all in. It’ll be over before you know it. I can’t tell you how helpful and accurate these tips really are! As a senior in college now (tear) I would like to think I have learned and used a few of these tips over the three years I’ve spent in college. Yes the freshman 15 is a big, scary thing, but not big enough to cause you to become obsessed with your weight and choose unhealthy ways to lose weight. If you simply try to choose healthier options most of the time, like you say 80% of the time, then you don’t have to be so hard on yourself when you just need to treat yourself. For me, late-night snacking out of boredom or simply to put off studying was my biggest problem. I have learned some great healthy options that I still love. Don’t be hesitant to try something “healthy”. It wasn’t until college that I discovered my love for spinach! And your tip about getting out of the dorm and doing things you love is the other greatest thing you can do for yourself. We have many mountains around my school and I love to go hiking. I also discovered the amazing benefits of running over the past few years as well. I hated running in the sports I played in high school, but running for enjoyment has kept me in shape, helped with my stress, and allowed me to get a better night sleep! If you’re like me and don’t like the treadmill, hit the streets and save the rec center for the classes! If you don’t have time to hit the gym, just skip the bus and walk to class. It is amazing the difference a 20 minute walk can make. Thanks for sharing your tips! These tips are so helpful and beneficial for all of us. These tips helps us to be fit. We should follow these tips. Thanks for sharing this post. After doing a bunch of stuff, take a lot of classes and learn both from the books and the life experiences, fitness become more important in college life. Great tips to tackle out.